Well guys, I didn’t quite manage to get all 30 designs complete within the 30 day time frame, but it was a great challenge none the less. I would definitely recommend this to anyone looking to stretch out of their comfort zone and explore their interior designer side. 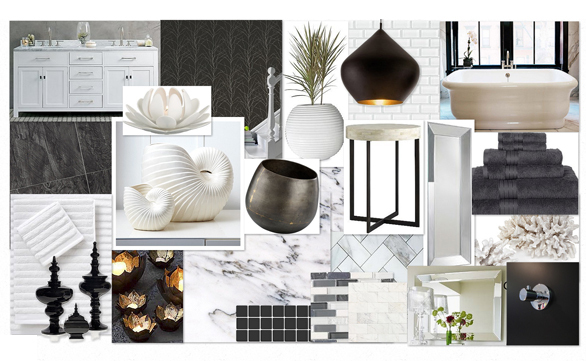 Today’s design is for a very sweet Olioboard member, Nicolek, who has a husband that wants black walls in their master bathroom. She’s not a 100% sold on the idea, but he definitely is and since he never really requests much when it comes to the decor of the house, she would really like to be open to this idea. Her main concern is that she can’t see black as being romantic. Challenge accepted. Nicolek, this bathroom design is for you. I hope it’s a design both you and your husband can enjoy. I think black walls can work in a bathroom and still create a romantic space as long as you add a good amount of white or another lighter colour to balance it out. If your husband likes the idea of black walls and you’re not entirely in love with it, how about a little compromise. Try dividing the wall in half. The lower portion could be paneled and painted white and the top half of the wall could be painted black or done in a black wallpaper. I personally, would recommend a black wallpaper over black paint. The pattern in the wallpaper would help break up the solid dark space. If you choose to go with a black paint, maybe try something that isn’t pure black, like a really dark, soft charcoal. Another thing to keep in mind is that you can also add items to the dark wall to lighten it up. Try an over-sized mirror over the vanity, like the one in the design above. Aim to get a mirror that is the same width of the vanity, to create a more balanced look. Add silver towel hooks, rails and crisp white towels. You could also consider adding wall sconces to either side of the mirror to help brighten up the space. You can use the tile choice in your bathroom to further tie the two colours together. Get a combination of grey, black and white tile in various materials (glass, porcelain etc…) to create a more interesting vignette. Finish off your design with some great accessories that fit within the style and colour scheme of the space and you’re all set.